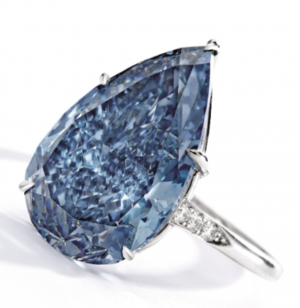 After fourteen years, Sotheby’s will be re-offering an extraordinary Fancy Vivid Blue diamond it sold in Geneva in 2004. 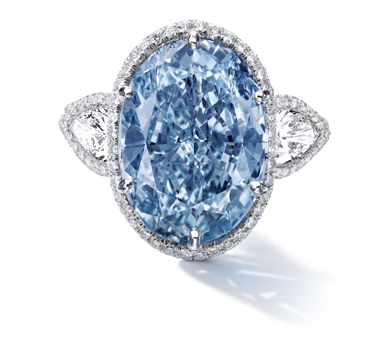 This will be Sotheby’s top lot for the Magnificent Jewels auction in New York on December 4, 2018, and it will also be its largest Vivid Blue diamond ever to be offered in New York. 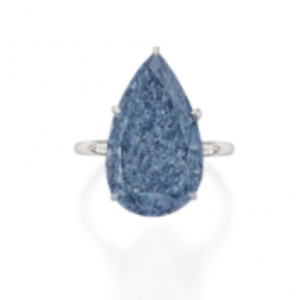 The last Similar (closest) size diamond that was sold was the 10.10 carat, Fancy Vivid Blue, Oval shape, with IF clarity on April 5th, 2016 by Sotheby’s in Hong Kong. It was the “De Beers Millennium Jewel 4”. 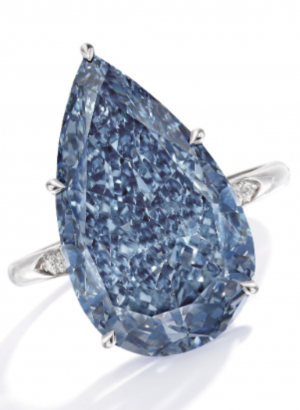 It was sold for $3.156 million per carat ($31.877 million in total). The diamond is being valued between $20 million to $30 million or $1.88 million to $2.82 million per carat. This is quite a modest estimate, and surely it will surpass the high value. I wonder why Sotheby’s has given it such a low valuation. The only reason it would be valued as such is due to the total amount. There are only a handful of people in the world that will have this amount available at any given time. Let’s remember that the potential buyer will technically still have about a month to pay it to Sotheby’s. It has also been viewed for several weeks prior to the auction, so whoever is serious about buying this diamond will have already started preparing money from various sources. 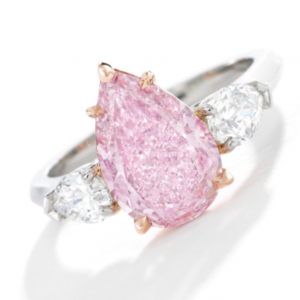 Sotheby’s will also be offering a 2.76 carat, Fancy Intense Purple-Pink Diamond, pear shape and a VVS1 clarity. It is valued between $1.3 million to $1.6 million total or $471k to $580k per carat. The current record holder for a 2-3 carat, Fancy Intense Pink diamond is the 2.13 carat diamond sold back on November 29, 2016. It was sold for $259k per carat. 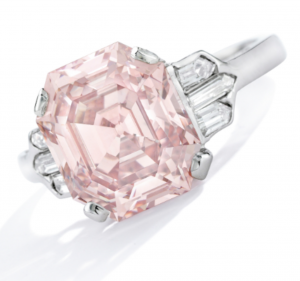 The total most expensive is a 2.85 carat Fancy Intense Pink sold for $562k total back on april 17, 2018. It is clear that even if the sale comes in at the low end of the valaution, it will break both records. A 6.46 carat, Fancy Orangy Pink diamond with a VVS2 clarity is being offered at between $600k to $800k total or $93k to $124k per carat. According to our “thumb rule”, an orangy secondary tone in a pink diamond will be valued at roughly half its pure color diamond. Currently a 6 carat Fancy Pink with a VVS2 clarity and good color would be valued at between $300k to $450k per carat, so this diamond should be worth about half or between $150k to $225k per carat. Let’s see what happens at the auction. 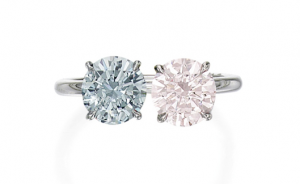 The last interesting item is a ring with a 1.07 carat, Fancy Gray-Blue with a 1.03 carat, Fancy Pink, both round shape and both have an Internally Flawless clarity. It is valued between $300k to $400k in total or $143k to $190 per carat on average. Normally a 1 carat Fancy pink round with IF clarity would be valued at $150k-$200k per carat, and the 1 carat Fancy Gray-Blue round and IF clarity would be valued in the $225k-$275k per carat range. Let’s see what happens during the auction. It is nice to see diamonds reappear in auction every once in a while, as this is the only true way to know the financial performance of certain diamonds, as no two diamonds are exactly the same, even if the certificates say they are. There are many elements that are taken into account for valuation. Something only a human eye can do!